This lamp has 36 high intensity LEDs making it one of the brightest lights on the market. It has two ways of being recharged. With a conventional 240V mains charger which has a 3 pin plug and simply fits into any 240v supply. The second and really useful is the 12V cigarette socket charger which is ideal when you are away from you premises. This has a burn time of between 3 and 4 hours and a charge time of approx 4 hours with either of the methods above. Note that the 12V car charger will take a little longer than the mains charger. It operate with simple on/off button so you can conserve the battery life when you not using the lamp. The push button on/off switch has two functions, push once for the worklight, then push again to turn the worklight off and the torch on, push again to turn it off. 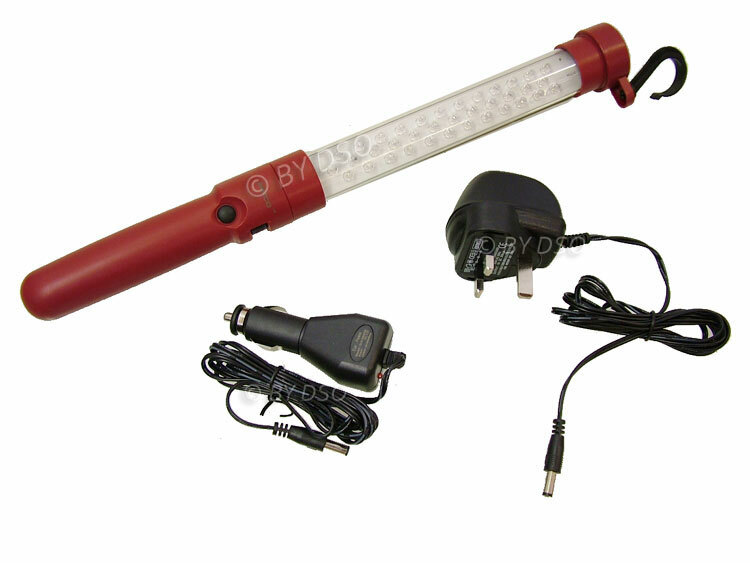 Last but not least it double up and a torch with a 7 LED lamp in the opposite end to the handle. The handgrip and top cover are made from ABS plastic and the tube is made from high strength PVC.